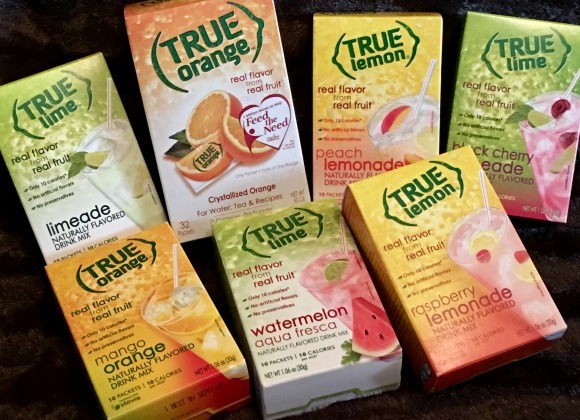 Stacy Tilton Reviews: I don't like water - But I do like TRUE Citrus water! I don't like water - But I do like TRUE Citrus water! I've said it before and I'll say it again..."I don't like water". I just can't make myself drink glass after glass of water everyday like I know I'm supposed to. No matter how hard I try I can't seem to get past glass one without giving up. Well, unless it's super hot out and I know I need to re-hydrate myself. Beyond that I just can't do it. I don't like the flavorless taste of water. However now that I'm trying to get myself back into a healthy lifestyle again I know I have to do something because I need that water. Right now that something is using TRUE Citrus products in my water. They give my water that added flavor that I desire, but don't add all of the sugar that I am trying to avoid. I really like that they come in little packets because I can keep a few of them in my purse for those times we go out to dinner. It has really helped me to make a better choice and order water (that I can spruce up) instead of sugary soda pop. It's just the beginning for me, but I'm doing my best to stay on task because I know my body and health are worth it. For those who like sweet True Lemon Lemonades and True Lime Limeades are only 10 calories per stick packet but deliver real flavor from real fruit in every sip. True Citrus has partnered with former Biggest Loser trainer, Kim Lyons, for their New Year, True You 30-Day Challenge. The Challenge features easy-to-follow workout videos, downloadable meal plans with simple recipes, helpful health and wellness tips, challenge tracking charts and more, all in an effort to help grow a simple New Year's resolution into a new year-round way of life. TRUE Citrus even has a blog right on their website that offers lots of fun 30 Day Challenges to help people like me stay on track. So go ahead and make the switch to water flavored by True Citrus today. Click here for a coupon.